Well folks..this Egg Tart recipe is worth trying..I kinda like the result cuz you can see the layers. 1. Mix and knead all ingredients for A and B separately to form a pliable dough. Cover with paper and chill in fridge for 20 mins. 2. Roll chilled dough A into a large rectangular sheet. Then shape dough B into about half of the size of dough A. 3.Wrap dough A with dough B. 4. Roll into a rectangular shape and fold into 3 layers. Turn it overand roll into rectangular shape and fold into 2 layers again. Turn it over and roll into a rectangular shape. Fold into 1 layers and cover with wrapper. Chil in fridge for 30 mins. 5. Remove, roll the pastry into about 1/4" thickness and cut into rounds. Chull in fridge again for 20 mins. 6. Remove, press into tart pan. 7. Slowly pour egg mixture into tart shell and bake at 190C (bottom heat) for 25 mins until golden brown. 1. Bring water to boil. Add in sugar and mix until dissolved, leave to cool. 2. Combine cooled syrup, beaten eggs, evaporated milk and vanilla essence and mix well. 3. Strain through a piece of clean cotton cloth into a teapot. 1 recipe for the skin is a lot..so maybe u may wanna try half. "Roll into a rectangular shape and fold into 3 layers. Turn it overand roll into rectangular shape and fold into 2 layers again. Turn it over and roll into a rectangular shape. Fold into 1 layers and cover with wrapper. " I can understand 3 layers but 2 layers and then 1 layer, what does it mean? 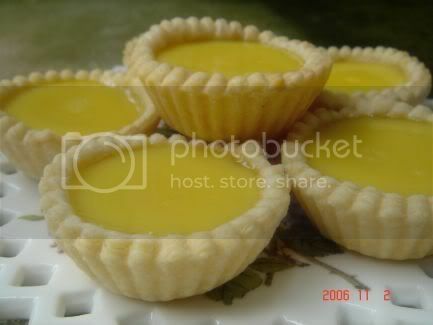 I wish to try this recipe of egg tart. TIA. Fold into 3 layers means you fold the dough 2 times. After folding, roll it into rectangular shape. Then fold once, roll it again... and..that's it! "Fold into 3 layers means you fold the dough 2 times. After folding, roll it into rectangular shape. Then fold once, roll it again... and..that's it!" if that's the case, then what does "fold into 1 layer" mean? If i am not mistaken, there is a step by step photo illustration in Cafe of the East blog. Ok Sherreen, got it already. Thanks so much. skpang, thanks for the reference. will sure take a look at it. there's only 4 of us at home and DH doesn't take egg tarts. so izzit possible to make 1/3 of the recipe? or maybe freeze the remaining pastry for future use? Thanks Sheeren... guess i've to wait for a day when there's some gathering then i'll give this a try.